Much took place during the North-West Rebellion. There were skirmishes, battles, and a massacre. For a complete list of events, one should read the University of Saskatchewan‘s North-West Resistance: Chronology of Events. Missing from this list is a battle between Amerindians. It is Gabriel Dumont’s first experience as a “warrior” and, therefore, marginal information. In 1851, at the young age of 13, Dumont was introduced to plains warfare when he fought at the Battle of Grand Coteau, defending a Métis encampment against a large Dakota war party. Duck Lake Métis force under Gabriel Dumont engage in an unplanned skirmish with Superintendent L. F. Crozier‘s Mounted Police and volunteers at Duck Lake. The Police are routed. Members of Mistahimaskwa’s (Big Bear) Cree Nation led by Ayimisis (Little Bear) and Kapapamahchakwew (Wandering Spirit) kill Indian Agent Quinn and eight other whites. Fort Pitt is taken by warriors of Mistahimaskwa‘s (Big Bear) band. Mistahimaskwa negotiates the evacuation of the fort by the North-West Mounted Police. Gabriel Dumont ambushes Middleton‘s column at Fish Creek. Colonel Otter‘s column attacks Pitikwahahnapiwiyin‘s (Poundmaker) camp at Cut Knife Hill. Otter is forced to retreat to Battleford. Pitikwahahnapiwiyin prevents Indians from attacking retreating forces. Amerindians (North-American “Indians”) participated in the North-West Rebellion. Pîtikwahanapiwiyin is Poundmaker and Mistahimaskwa, Big Bear (Gros Ours). Pîtikwahanapiwiyn surrendered to General Middleton at Fort Battleford. Mistahimaskwa surrendered at Fort Pitt. Kapapamahchakwew is Wandering Spirit (Esprit Errant). Sources disagree on whether the Amerindians I have mentioned served a prison sentence or were hanged. I have read that many were hanged. Gros Ours’ (Big Bear) statement is totally justifiable. As Joseph Boyden noted, all the Métis wanted was title to their land, their rectangular lots abutting a river. 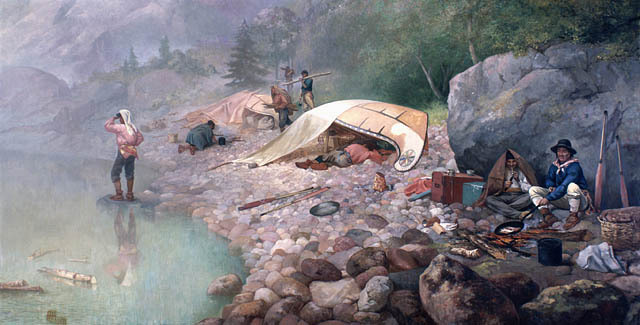 This is how Métis and the whites had lived from the time the fur trade began, or from the 17th century until the 19th century and Confederation (1867), or the purchase of Rupert’s Land from the Hudson’s Bay Company, by the Dominion of Canada in 1869. The Hudson’s Bay Company fought the North West Company until 1821, but the Earl of Selkirk had settled the Red River Colony (1812) in a manner that was acceptable to its inhabitants, diverse as they were. Moreover, although Amerindians had been conquered, they had been free to roam their land since Jacques Cartier claimed Canada for France, in 1534 until 1763. French settlers had married Amerindian women when the number of European women in Nouvelle-France was much lower than the number of European men. (See King’s Daughters, Wikipedia.) The King’s Daughters, 800 women, arrived between 1663 and 1670. Sixty years are a long time. The Iroquois often attacked the French settlers. They also tortured and killed missionaries (see Canadian Martyrs, Wikipedia), but other tribes, the Algonquian tribes, the Abenakis especially, were friendly tribes. Many Quebecers have Amerindian ancestry. However, it is difficult for Québécois-es to be recognized as Métis. Métis are the descendants of persons involved in the fur trade. To a certain extent, Confederation was a mixed blessing. It created a Canada that would stretch from coast to coast, which all Canadians enjoy, but Confederation happened at a cost, as did colonialism in general. the execution of Louis Riel alienated the French-speaking citizens of Québec. Quebec was one of the four provinces that joined Confederation in 1867. They believed they would be able to live and maintain their culture in Quebec and outside Quebec. However, William McDougall and Orangemen were anti-Catholic, anti-French, and racist. In other words, when provinces joined the Confederation, the Royal Proclamation of 1763 was brushed aside and so was the Quebec Act of 1774. Canada has been officially bilingual since it passed the Official Languages Act of 1969. As for the rights of Métis, they were not recognized until the Constitution Act of 1982, otherwise known as the “patriated” constitution, which Quebec has not signed. I will not discuss what I would call the “Amerindian question.” It is an extremely complex issue. I reset my computer successfully. As for my diagnostic, it cannot be established with certainty. Mild cognitive impairment is a symptom of chronic fatigue syndrome or myalgic encephalomyelitis (ME), which has bedevilled me for decades. In other words, all is well. Ô Canada! mon pays! mes amours! Wikipedia (words). This post is a continuation of Louis Riel, Hero or Rebel, published on 18 March 2018. The main subject matter of my earlier post was the Red River Rebellion, and résistance remains our subject matter. However, we will be focussing on William McDougall. William McDougall was the lieutenant-governor designate of Rupert’s and the North-West Territories. He and his party were prevented from entering the Red River by Métis, led by Louis Riel. I will also introduce Gabriel Dumont, a Métis who left the Red River in 1869-1870 and settled in Saskatchewan. Dumont spoke six first nation languages and Michif-French, but did not speak English and could not write. (See Gabriel Dumont, The Virtual Museum.ca.) He went to Montana where Louis Riel taught school and asked for his assistance in petitioning the Canadian government to ensure that Métis did not lose their river lots and Amerindians, their land. In 1873, three years after the Wolseley Expedition, an emboldened Dominion of Canada had established the North-West Mounted Police and a railroad that would ensure Canada stretched from sea to sea, a Mari usque ad Mare, was under construction. The railway was a promise to British Columbia. To some extent, we are revisiting the Red River Rebellion because there are gaps to fill. First, Riel’s story begins in the Red River Rebellion and ends in the North-West Rebellion. Métis leader Gabriel Dumont was born in the Red River settlement and he is the person who asked Louis Riel to come to Saskatchewan to help him appeal to John A Macdonald’s deafened Canadian government. Louis Riel would be hanged a few months after the Battle of Batoche which was not only the end of Riel’s story but also that of the North-West Rebellion. 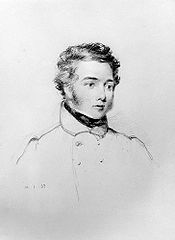 In the Red River, William McDougall, a Clear Grit, met members of the Canadian Party, two of whom were Doctor John Christian Schultz and Charles Mair. The Canadian Party supported Canada’s expansion westward, a noble cause, were it not for William McDougall who was anti-Catholic and anti-French. His world was white, English and Protestant. It was Thomas Scott’s world, who was and sentenced to death by a Métis court and then turned into a martyr in a 19th-century Orangist Ontario. The growing threat, in his view, was ultramontane interference from Lower Canada in the civil affairs of the united province, a fear that would increasingly distort his political perception. Therefore, one wonders why he was appointed lieutenant-governor of Rupert’s Land and the North West territories. No poorer choice for the post could have been made, in view of the necessity for diplomatic caution in dealing with the officials of the HBC and with the lay and clerical spokesmen of the various groups at Red River. The transfer was to take place on 1 Dec. 1869. In July 1869, William McDougall, then minister of public works, sent a survey party to the Red River under Colonel John Stoughton Dennis. In fact, a team, including Thomas Scott, was already building a road linking Upper Fort Garry (Winnipeg) to Lake of the Woods. It would be called “the Dawson Road,” after Simon James Dawson, a surveyor exploring the country between Lake Superior and the Red River settlement, in 1857. Yet, the transfer of Rupert’s Land to Canada was to occur on 1st December 1869. Under such circumstances, Métis and Amerindians had cause to fear a takeover of Red River. As well, one can understand that its inhabitants felt alarmed when “strangers” attempted to settle in the former Red River Colony. Since the arrival of tens of thousands United Empire Loyalists, including 3,000 Black Loyalists, the English-speaking population of Britain’s still new colony to the north of the United States had increased significantly. On 15 March 1870, Taché read a telegram in which Joseph Howe, the secretary of state for the provinces, stated that the “List of Rights” was “in the main satisfactory.” Delegates could go to Ottawa. On 23 and 24 March, a three-man delegation left for Ottawa. These were Abbé Ritchot, representing the Métis, Judge Black, representing the English settlers, and Henry Scott, representing the Americans. Negotiations were successful. On 12 May 1870, the Manitoba Act received royal assent. On 24 August 1870, the day the Wolseley Expedition reached Fort Garry, Louis Riel learned that the soldiers planned to lynch him. So, he left Fort Garry. Before leaving, he told Bishop Taché that his mission was finished. His mission had been a negotiated entry of Manitoba into the Canadian Confederation, but, in 1890, French ceased to be one of the two official languages of Manitoba under Premier Thomas Greenway. Bilingualism would not be revived until the Official Languages Act of 1969 and the Manitoba Act would not be recognized until the Constitution Act of 1982. At the moment when the corpse of Riel falls through the trap and twists in convulsions of agony, at that moment an abyss will be dug that will separate Quebec from English-speaking Canada, especially Ontario. The art works featured in this post are by William Kurelek, a Canadian Ukrainian who was raised in the Canadian prairies. 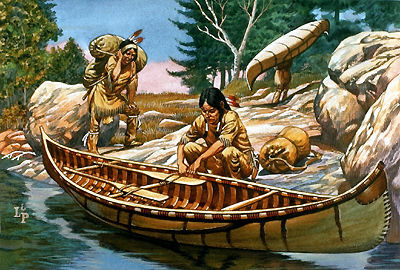 The voyageurs were the French-speaking Canadian boatmen or canoemen, who travelled in birch-bark canoes from Ottawa or Lachine, to fur-trading posts in what is now Manitoba and Minnesota, Grand-Portage being the main trading post. First, they had to short-legged. 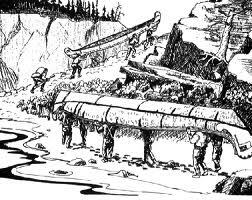 Being short-legged was important because they had to transport as much fur as possible relatively small canoes and much of the fur was stored under each canoeman’s seat in the canoe. There was very little room for their legs. Second, a strong upper body was an essential characteristic. 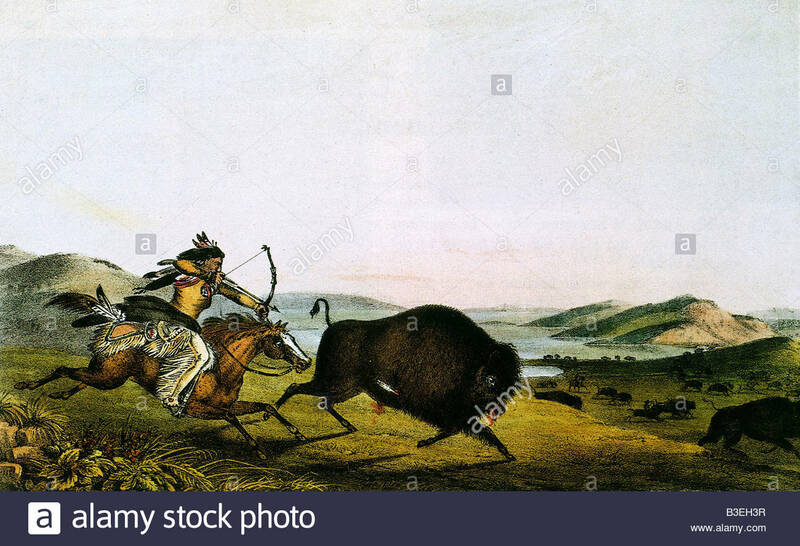 They sometimes had to go from one waterway to another waterway and when they did, they carried fur (usually beaver pelts) and personal supplies on their back, bundles called bales, they carried on their backs, weighed more than 40 kilos (about 90 pounds), perhaps a conservative figure. And they also had to carry their canoe. These parts of their trips were called a portage (from the French porter: to carry). Third, they had to be good singers. 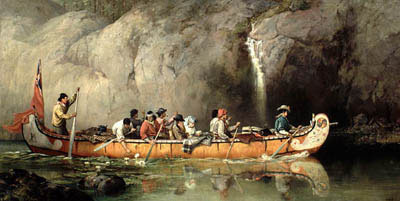 Travellers to North-America, fur traders, employees and governors of fur-trading companies, such as the Hudson’s Bay Company, historians, and others often reported that the Canadien voyageur, sang as he paddled canoes filled with precious pelts. Les Trois Cavaliers fort bien montés (The Three Well-Mounted Horsemen), a folksong, inspired Irish poet Thomas Moore to give it new words in 1804. It became the famous Canadian Boat Song. 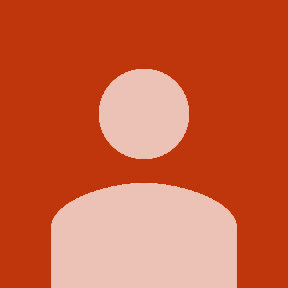 C’était des hommes choisis ! Les plus beaux chanteurs du monde! 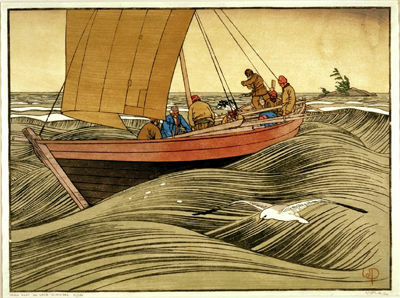 Portages were so difficult that the men often chose to “shoot the rapids.” At such times, I doubt that they sang. “Shooting the rapids” was dangerous and many men died. Alongside the rivers the voyageurs used to go from Lachine (Montreal), or Ottawa, the usual points of departure, to what is now Manitoba and Minnesota, there are little white crosses. The voyageurs left small white crosses where boatmen had die. We have to distinguish between the voyageurs who had a licence to work in the fur trade and those who roamed the forests without the proper permit, called coureurs de/des bois. As for the voyageur, he was a hired man: an engagé. But the coureurs des bois were adventurers. They roamed the woods without a permit and if they got caught fur-trading, they faced sanctions and the beaver pelts they had not sold were confiscated. 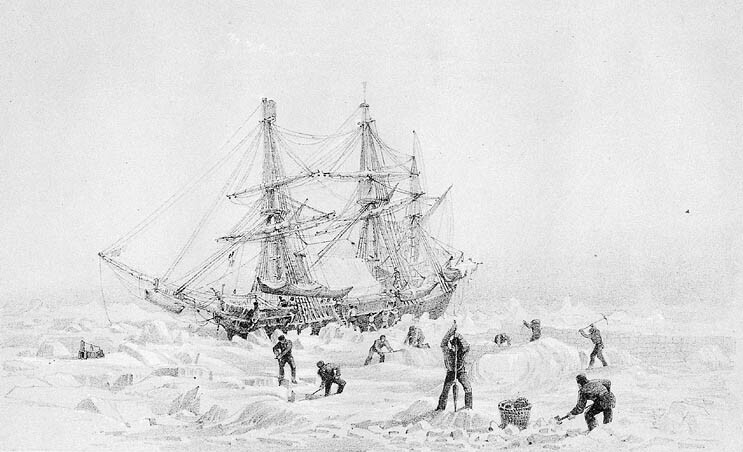 These men usually signed a three-year contract which meant that they often left behind, a wife and children to whom the earnings of the voyageur were usually sent. However, many men lived with Amerindian women or married Amerindian women. Their children were Métis. However, some voyageur wanted to marry a French-Canadian woman and simply waited. Canada’s Louis Riel‘s grandfather, Jean-Baptiste Lagimodière, went to Quebec to marry Marie-Anne Gaboury, the first white woman to settle in Western Canada. Their daughter Julie married a Métis named Louis Riel and they had a son they named Louis Riel. Several Métis remained in Manitoba, but the Battle of Batoche took place in Saskatchewewan. Many retired in Minnesota, USA. Those who did had usually been employed by the American Fur Trade company, founded by John Jacob Astor in 1808. I will continue to tell the story of the voyageurs, but let this be the background. We have actually gone a long way. For the time being, I will continue to reflect on the fact that these men sang despite the dangers they faced and their isolation from their home. [i] G. Kohl, Kitchi-Gami. Wanderings Round Lake Superior (London: Chapman and Hall, 1860). Available in paperback, with an introduction by Robert E. Bieder, under the title Life Among the Lake Superior Ojibway (St. Paul: Minnesota Historical Society Press, 1985 ).